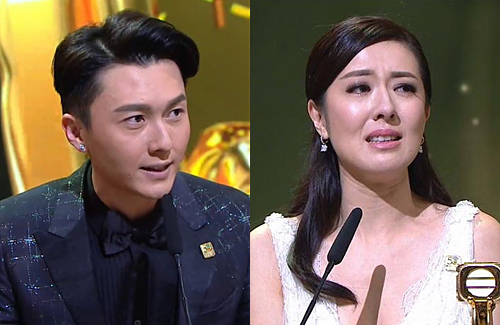 The 2017 TVB Anniversary Awards concluded on January 21, with Vincent Wong (王浩信) and Natalie Tong (唐詩詠) winning Best Actor and Best Actress respectively. Joel Chan (陳山聰) won Best Supporting Actor, while Rebecca Zhu (朱晨麗) won Best Supporting Actress.The race this year was especially tight, as the media swayed in different directions over potential wins prior to the awards ceremony. Winning the Best Actor award for Legal Mavericks <踩過界> at Singapore’s Starhub TVB Awards in October, Vincent Wong was once again honored at the TVB Anniversary Awards. 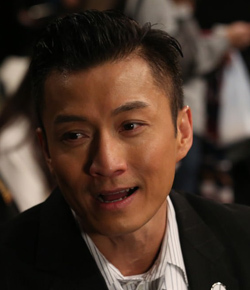 In his ten-year career at TVB, Vincent has slowly worked his way up from supporting roles to main lead. Ali Lee (李佳芯) and Jessica Hsuan (宣萱) won Best Actress awards in Singapore and Malaysia respectively, which drummed up speculation that either actress would repeat their victory at the TVB Anniversary Awards. However, this week the media reported that Natalie Tong extended her TVB contract in exchange for the station’s top award. While the 36-year-old shot down the rumors, Natalie managed to break through the competition. Joel Chan has always been a solid actor, but his controversial relationship with heiress Florinda Ho (何超雲) had nearly ruined his career seven years ago. However, the breakup and subsequent career standstill only made Joel more determined to work harder in his TVB comeback. After winning Miss Hong Kong 2011, Rebecca Zhu has been appearing in numerous TVB dramas. She recently even got promoted to lead actress in the upcoming The Stunt <特技人>. However, winning Best Supporting Actress came as a surprise for Rebecca as well as viewers. 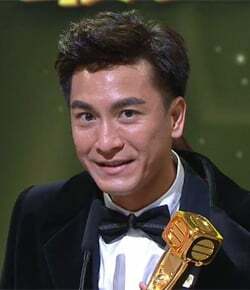 Nominated ten times for Best Actor, Kenneth Ma (馬國明) posed as the strongest competitor for Vincent Wong in this year’s race. Despite media buzz and fan support, Kenneth ended up winning the My Favorite Male Character award instead for his performance in The Exorcist’s Meter <降魔的>. Since winning first runner-up at Miss Hong Kong 2013, Sisley Choi (蔡思貝) has quickly ascended the ranks at TVB and heavily cast in many dramas. Winning My Favorite Female Character for Legal Mavericks, Sisley appeared to be shocked and her eyes grew red. She thanked many people on stage and was grateful for the opportunity to star in the drama. Mat Yeung (楊 明) won Most Improved Actor and Mayanne Mak (麥美恩) won Most Improved Actress. My Ages Apart <誇世代> won for Best Drama, while The Exorcist’s Meter was voted as the Global Online Favorite Drama award. Carol Cheng‘s (鄭裕玲) Dodo Goes Shopping, Season 2 <Do姐再shopping> won Best Variety Show and Hosting awards. What a surprise. Very deserving and undeserving winners (BSA). Vincent Wong – Wow, nice surprise. I didn’t care any of those supporting ones thou, overrated!!! So this awards was just diving meat up. 5 winners for best variety program? … Rebecca Zhu winning BSA? Sam Ko or Zoie Tam easily beats her in terms of acting and seniority. Natalie won bc Jessica didn’t come. I cannot believe Kristal and and Elena Kong did not get nominated for BA. Tiger Mom Blues should have won for best drama. My Ages Apart won cause it was an anniversary drama, and they couldn’t have Exorcists Meter win two awards. Joel Chan was deserving, but imo not for his role in unholy alliance. Sad that LLL didnt get a nom for his role in LM. The only deserving award was Mayanne, Kenneth, and Vincent. Vincent seemed too eager to win it, his speech was really templated. @bubbles23 read until u said tiger mum should win best drama. Duh! My Ages Apart was funny but was all over the place. Legal Mavericks had a typical legal drama plot, Unholy Alliance… Lol it was really bad. Destination Nowhere everyone forgot about. Hm… looks like Exorcist Meter had the best plot but was not as popular with older viewers. What is your pick then? @bubbles23 I agree My Ages Apart is funny but all over the place. I was surprised it won. Best Drama. I would rather The Unholy Alliance or Legal Mavericks win. Vincent Wong is very well-deserved to win but as for the Best Actress, I don’t understand how come Natalie was nominated and given the award? She wasn’t even a lead. If she was nominated for Best Supporting Actress, that would make sense. Jessica should have won it. Maybe rumor has it. Exchanging contract for award just make it look cheap and meaningless. @nori Jessica was a no show = no awards. @nori as usual tvb awards always rigged and this time they dont even explain hw the scoring was counted. Maybe they jus giv the award to natalie so the rest of the actresses dun need to fight n jealous since every1 knows natalie is most jus a keh leh feh n underserving. I cant recall her successful lead drama. @lam86 I totally agree with you that TVB award systems always rigged. Natalie nomination and win actually reminded me of 2012 TVB awards where Aimee Chan was nominated for the Best Actress in The Last Steep Ascent instead of Maggie Cheung Ho Yee because Maggie has left TVB. I was like how come they replaced her with the one whose acting is only at mediocre level. Aimee didn’t win though. Now they did it again using Natalie to replace Jessica just because she was attending the ceremony. @nori 2012 was 100% so called audience voting. But so fake until let wayne lai winning as tai kam. Damn fake. Suppose raymond lam should win it. After all these years we can see tvb control all. They wan giv who they like. But nw they also smart. They knw many people wun faithful. Will leave tvb anytime. Example that 5 finalists best female actress, only natalie n nancy wun leave tvb for sure. That nina pow, ali n kristal can leave anytime. So they giv natalie better. Nancy adi 2 times so cannot giv. So u see what tvb thinks we wun knw n cant blame them. They must giv vincent win 1 time so his heart happy act more dramas n loyal. Hehe. Tvb is smart actually…n they also knw moses n kenneth wont go anywhere except tvb. Hehehe. @jimmyszeto too many good veterans there. Giv who also the other veteran will unhappy. So giving to the young one a good decision actually. Invest to old veteran no use. Anytime can stop filming drama. Tvb getting smarter nw. Vincent deserves the prize but Natalie I’m not sure. There’s not enough good fa dans anymore right now. The result that gave me most surprise is Best Lead Actress and Best Supporting Actress. Before the award, no one even mentioned Natalie as a possible win. It’s all about Ali and Jess. As for Rebecca Zhu, she has improved in her acting, but, not enough to win when many others in the list are better than her. Grace Wong did better than her in the same series. @kidd I was like why why sisley why her. My fellow tv watcher says tvb wants to promote them. I don’t know how popular Sisley’s character is compared to other nominees. But, from the few episodes I watch of ‘Legal Maverick’, I think her character was designed to be likable. Maybe if she get the ‘Most Improved Female Artist’ award, it would be more suitable. I think she has improved a lot in her acting and has become more natural. I can see that she did listen to criticism. After audience complained about the noisy voice in an earlier series, you can see her trying to adjust her voice in subsequent series. @kidd I thought Jessica would get TVB Best Actress until she said last week that she may not go to the Anniversary Awards. It was probably the biggest hint that Jessica wouldn’t get the award after all. But a lot of media buzz was for Jessica to win as it emphasized on “My Unfair Lady” being her most representative work. There was a slow buildup in buzz for Natalie Tong as well. It started with Natalie crying at an event when she spoke about making $3000 HKD per month. Last week, there were reports that claimed Natalie extended her contract for the award. Then Tony Hung wrote a social media post on how he thinks Natalie is a Best Actress in his eyes as encouragement before awards night. There were hints that Natalie would win. TVB likely gave it to Natalie so she can lead more series in 2018; there is the upcoming medical drama opposite Kenneth Ma. By awarding Ali Lee in Singapore and Natalie in HK, now TVB has two relatively young “Best Actresses” in their lineup to create more buzz for their series and boost their careers to the next level. @jayne I thought Jessica would win Best Actress too, until she said she may not be going to the Anniversary Awards. But it is still very surprising that Natalie won, I thought her role was a supporting one not the lead actress, which is weird but proved that it was rigged. @jayne natalie young? she is already tvb’s actress since 2000. do you mean “young” as leading actress? that sound more logical. i’m disappointed that kenneth didnt get the best actor award. but im more disappointed in his speech,not really inspiring and motivated as that of vincent. it seems kenneth is not very happy with the best favourite award. the best speech is the speech from joel chan its very impressive,and the worst is sisley choi she looks so fake. many ppl say natalie didnt deserve the best actress award, but in her speech i can see how many efforts she puts in her work through the years to get where she is now. @jayne are you saying tvb feel sorry for Natalie that’s why the best actress goes to her? If that’s the case I don’t think it’s fair for other who works even harder than her and might earn less money too right? @cutie777 “are you saying tvb feel sorry for Natalie that’s why the best actress goes to her?” No TVB doesn’t give out pity awards…it’s a commercial reason to promote her more in 2018. “My Unfair Lady” was a hit and TVB would rather give Natalie the award to push her career heights further as she’s 36 and can still can lead dramas for another few years. TVB already has plans to cast her in a medical drama opposite Kenneth Ma in 2018. The interview earlier about Natalie earning $3000 HKD is to generate publicity for her before awards night. Everyone likes to hear a success story about struggling artistes who finally make it. Vincent Wong also has a similar story to share, in fact I think it’s a lot tougher on him financially since he already has a daughter. So why did TVB choose to focus on Natalie for this “struggling artiste” story? Likely to gain more positive publicity for her before her controversial win. @jayne so you mean the succes of my unfair lady is due to natalie? im not so sure of it. jessica hsuen has also a great part and i think even bigger influence of the succes. so why do tvb didnt promote her? she is more popular world wide and has more fans than natalie i think. but natalie has improved a lot, so she also deserve the award. I guess I’m very behind in the e-news lately. I didn’t now about these foreshadowing news reports on Natalie. The only report I’ve read is her and Tony supposedly has gotten back together. Still can’t believe Natalie ,Sisley and rebecca won those big awards. TVB awards really have no meaning the last couple of years lol. And no awards for veterans for their hard work. @hannah Sisley is watchable as she has improved. Way better than Grace Chan. I was shocked My Ages Apart won and was very happy. But Rebecca Zhu? Well her speech was good but her performance was subpar. But Sisley, I know she has fans and I don’t care if I get red arrowed but after her win and her speech my impression was she is a bimbo or an airhead. Much like Kenneth Ma’s an airhead but he was humble airhead. Sisley sounded arrogant. She’s not articulate that’s for sure and her performance was nothing. The rest no comment. Award show seems subdued or rather low budget. But Hubert singing was the highlight for me. And I can see how much Kenneth is liked by his colleagues. @funnlim I think her performance was good. Which made me like her character. I don’t think she sounded arrogant though, she used the criticisms to help improve herself which is good. I watch Sisley’s speech on youtube yesterday. I think it’s heart felt. She’s turning criticism into something positive. I don’t find that arrogant. The part where she said she hated everything about herself after she reading criticisms after criticisms, you can see that she was truly hurt. And finding some useful way to channel that hurt is a good thing. @kidd unfortunately she is not articulate and she should just say thanks and leave the stage. As she went on with her speech my impression of her went down the hill very fast. She sounded like as of right and entitled. Rebecca had the same criticisms but she said ir more elegantly. Sigh…must be kidding me about the best actress award it should goes to Elena Kong she’s much better. I’m ok with Vincent winning the best actor too bad Kenneth didn’t win I was hoping The Unholy Alliance won the best drama oh well this year award is dead like they screw everything very disappointed. @cutie777 I was disappointed The Unholy Alliance didn’t win either. I was hoping either The Unholy Alliance or Legal Mavericks would win. Its between my ages apart and exorcist metre for me. Tvb can divide the pork better by creating new categories like best drama and best comedy and best ensemble cast. My ages apart deserves the award. It broke a lot of grounds in terms of dialogue and story. Some performances were unexpected as well. It was funny consistently and it managed to get to 50 episodes and ended with a bang. Can’t ask for more these days. Its actually witty and intelligent series making some seriously funny observations and yet manages to tug the heart. Oh Matt yeung most improved? I’d give it to Herbert wu. That talented beast can sing I think dance ok and can seriously act. Remake jttw pls. He must be the monk. Love his speech too. Here are my (long) thoughts on the awards. Best Actor – I’m a Vincent fan, so I’m definitely happy that he won. I think the audience is very split between him and Kenneth (although Kenneth probably has more support). It’s unfortunate that Vincent’s win might put him on the “bad side” of a lot of people since they feel like Kenneth should have won, but in my opinion, Vincent definitely earned + deserved it. I would have been fine with Kenneth winning too though. Best Actress – Shock. 1) Natalie Tong was obviously the supporting actress, 2) the only thing I remember about Cherry is that she dated + dumped Saving, which actually just showcased Vincent’s acting and not hers, 3) her ON-SCREEN COUPLE with Vincent was a hit topic but not her character, and 4) her acting is not better than Elena & Kristal, who didn’t even get into top 5, Jessica, Nina or even Ali. Every year we get Best Actors and Actresses who are flamed or being “undeserving” of their awards, but that’s usually due to a stronger contender being snubbed… this time we ACTUALLY have an undeserving BA. Just unbelievable. Favorite Male Character – No real opinion besides that I agree wholeheartedly with this decision. Favorite Female Character – I like Sisley Choi and think her character was quite memorable this year, but sigh because a lot of people still haven’t been converted over so TVB is ruining her life again but giving her such a huge award when there are other females with just as memorable characters and she is still in the process of gaining acceptance form her viewers. Poor Sisley. I don’t disagree with her getting the award, but pity the potential aftermath she will have to face. I know I’ve said this before, but her performance this year should have earned her the Most Improved Female Artiste award instead. It would have kept her in the positive books and deservingly rewarded her for her improvement. Best Supporting Actor – Joel wasn’t my personal pick, but his win is not surprising for me. Best Supporting Actress – Shock again. Like Natalie Tong, it’s insane to think Rebecca Zhu was even on the top 5 list let alone the winner. I actually quite like Rebecca and think her acting is quite good (she’s hindered by language more than acting skill imo), but she definitely wasn’t BSA material with Mandy Lam and Elaine Yiu in the running. Even Tracy Chu’s Yanice was more memorable than her character. Most Improved Male Artiste – Mat Yeung wasn’t special this year. I think he did better last year. Other people should have received it, in my opinion. Most Improved Female Artiste – I don’t really pay attention to Mayanne Mak’s works so have no opinion. Best Drama – I mean… at least it wasn’t HOG3 or LW2. My Ages Apart is actually really fresh and creative, and at least TEM was still awarded some form of Best Drama award (albeit it not being the main one). @melia880 I agree with all your thoughts on each category. Sisley…I also feel bad for her. Her performance this year was actually turning her image around. After LM, I saw many comments (in forums where she usually gets bashed) praising her improvement. Even my brother who usually leaves the room when she’s on screen said she’s watchable now. I already see the backlash towards her. I was really hoping Ali would win My Favourite Female Character….I didn’t want her to win BA cause it would bring her even more antis But she would have been deserving for MFFC. Sigh. The female winners are so disappointing except for Mayanne. Also unpopular topic but I was really annoyed at how they changed the awards for the variety categories. There were a few shows I liked this year. I’m still surprised that Rebecca won BSA. She probably won because her contract with TVB is almost over. Seeing that she won Miss HK in 2011 and TVB contracts are usually around 8 years long, this means that this year is her 7th year at TVB. Maybe gave her the award to convince her to stay. @greentea they’re probably pushing her as an upcoming fadan. Pretty sure TVB was confident she will stay since Rebecca’s the leading lady of their upcoming movie and at least 2 dramas next year. This is going to sound sexist, but all the female winners are somewhat undeserving except Mayanne. WTH happened, did all the actresses make side deals or something. Ali, Elena, and Kristal were not necessarily better but definitely just as good. And they make more sense since they’re actually the lead actress in their shows. Natalie should have won BSA not BA. Hell even Moon Lau was better than Rebecca Zhu and should have won BSA if Natalie took BA. And even with Mayanne, she’s great as a host/MC but the award is kinda of odd I guess. I would think it’s meant for actresses who actually appear in dramas and what not, guess you just can’t beat Carol Cheng. TVB keeps touting the fact that they allow audiences to vote for the “big categories” but looking at the results, that is obviously a bunch of hogwash, as most of the winners are obviously artists that TVB is planning to promote in the coming years. I think this became even more clear when, after the awards show, TVB exec Virginia Lok mentioned that several of the winners (referring specifically to Rebecca and Sisley) are artists that director Wong Jing especially pegged as his choices to lead in a few of his movie (and TV series) projects in the coming year. So basically, TVB used their anniversary awards as a platform to fast-track the artists they have huge plans for in the coming year to the positions they need them to be in, which to be honest isn’t good at all for those artists because they haven’t reached those levels yet…forcing them into those “big shoes” that they are not yet capable of filling is going to do nothing but bring them (the artists) backlash and hate. To me, the biggest disappointment isn’t really the results of this year’s awards, but rather, it’s seeing that TVB is up to their old tricks again – I guess TVB really hasn’t learned anything from their past 50 years in existence…. I also don’t think that the major categories awards were really based on audience votes by looking at the shocking results last nite. Yes, Natalie is a good actress and can act, but i agree with you that she lacks the onscreen charisma…and i’m also not keen to watch a drama with her as the main lead. The female categories are basically to award those that TVB wants to promote heavily in the coming years; eg. Natalie, Rebecca and Sisley. But even so, i feel that they should have reserved the Best Actress award to the deserving actress, especially as the station is marking their 50th anniversary. I believe Natalie will be equally happy if she is awarded the Most Favourite Female Character, and that award also can promote her to the next level like Grace Wong (2016 winner of the same award) who is now promoted to lead actress. Meanwhile, Sisley would be more deserving for Most Improved Female Artist…and winning a big award for her first time (in HK) will only bring more hatred towards her again. Yes and yes and yes to Vincent Wong’s win!!! His performance is outstanding in LM. How often do we see a blind lead character in TVB. And yes to Sisley too!!! I know I’m gonna get lots of hate for this, but I’m not gonna care. However, to win for Fav Character is a stretch. I’d have awarded her for Most Improved. But I’m still happy that she is finally acknowledged! Natalie and Rebecca, – huge NO. I’d have voted for tai siew jie in Come Home Love!!! And what about Kristal Tin in Destination No Where!!! This TVB 50th Award thing is killing me! 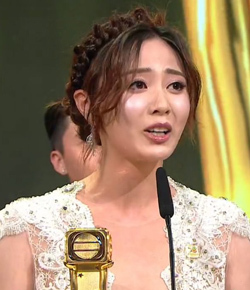 Best Drama – MAA – I have no objections because I actually love the drama and it’s my first time in 8 years completing a 50-episode series without fast forwarding. Although I personally would have preferred Legal Mavericks. Best Actor – YES!! Vincent for sure!! His performance was outstanding in LM. Best Actress – Natalie deserves recognition but not BA material. Her performance in MUL may be best as fave character “Cherry” but I don’t think it’s BA worthy. I personally think Jessica from MUL or Kristal from DN was a better actress. Male Character – Oh yes! I will choose Ma Kwai for sure! His role was written so good and heartwarming definitely! So kudos to Kenneth for this! Female Character – I have no objections to Sisley’s character as Dino in LM. But I think it’s a far stretch for sure to award most favorite female character. Poor girl will be getting a lot of bashing now and she has not updated her IG yet. Sisley should be recognized, don’t get me wrong, but not fave character. I think Most Improved will be a good start for Sisley. Hate that TVB pulled her out of the nomination and had Jacqueline instead. 🙁 I personally would have preferred PARIS (Ali) to win the most fave character award. Best S Actor – no objections but i preferred Jimmy Au or the chubby guy in TEM. Best S Actress – I AM SHOCKED to the utter beyond belief that Rebecca won. WHY HER? Seriously why her? How in the world did she beat Mandy Lam, Elaine Yiu and Tracy Chu? There is no way she can beat the ones in the nominated list. It’s so rigged. It’s so unbelievable. Rebecca’s role in GSE was not even memorable enough. Even if Moon Lau winning BSA as Bear Bear, I wouldn’t be mad… but Rebecca? Ugh! MI Male – Matt Yeung . Long overdue for sure. MI Female – Mayanne is definitely good in hosting. Might be chosen to succeed Dodo in future. As mentioned previously, Sisley should be nominated in this category and bag the MI award because she really improved leaps and bounds in 2017. Not sure what TVB is thinking … but here we go…what is done is done. We can only protest this much! No election or selection is perfect. If we discover how rigged it is for the selection of Donald Trump as US president, don’t be too shocked to see TVB is doing the same. Just live with it. An award does not mean a damn thing. It will be tarnished. Tomorrow is another day. We still need to prepare for tomorrow whether we win or do not win. can’t believe Natalie, Rebecca and Sisley won! And I like Matt but “most improved? ?” !! that’s just nuts!!! Natalie is NOT at that level!!!! Happy that MAA won best drama as I really like that show and happy that Kenneth won favorite character as Ma Jai is awesome!!! Best Actor – Yes!! Vincent Wong FTW! The heavens do have eyes! Best Actress – I used to think Natalie Tong was only an average actress, but honestly in the last few years, her acting has gained my approval. I do think she can be leading lady material, but it’ll be a bumpy ride for her from now on to maintain the position. As for whether she deserved Best Actress for this year, I’m afraid not everyone agrees. I’m a fan, but she’ll need to prove herself further. Best Supporting Actor – Joel Chan deserved BSA, but not for his role in The Unholy Alliance. No shade, but it’s not that difficult to play his role well. Best Supporting Actress – Rebecca Zhu; I don’t even know where to begin. How in the world did she pop out of nowhere? Haha I didn’t even know she was in the running! Zoie/Ali (though I think she’s overqualified in this category)/Kristal/Elena should’ve won instead. My Fav Actor – Kenneth Ma, well deserved! My Fav Actress – Sisley? I agree with everyone else – she could’ve won Most Improved instead. I wished Ali won in this category – I really enjoyed her role as Paris in MAA. Most Improved Actor – Mat Yeung – Ok I haven’t watched all the TVB dramas from this year, but I don’t remember any of the good ones having him in it. Not memorable as a character to me. But maybe he does deserve it. Most Improved Actress – Who da heck is Mayanne Mak? Da hell. Where did she come from?? Sisley should be here instead. @coralie that’s exactly my thought I’ve never heard of her either. @coralie The most deserved win in women category is Mayanne. Not portraying anything in a drama does not mean that you can’t win. She is picked to be replacement for Eric Tsang or DoDo Cheng (as a host). @lewismcchan People don’t usually watch the anniversary awards for hosts. You don’t see Dodo or Eric or any of the hosts getting awards for being great hosts. That’s why I’m confused why she’s even on this list. Not saying she doesn’t deserve an award for being a great MC, but I’ve never even heard of her. @lewismcchan @coralie Surprised you haven’t heard of her as she is so LOUD. Dodo or Eric wouldn’t get this award because they haven’t been “most improved.” This is basically the only category that any host can get since all the other ones are pretty much for acting/roles only. Mayanne’s win was definitely deserved. She is great at hosting/public speaking. @lewismcchan @kaykay But the award is called “Most Improved Actress,” not “Most Improved TV Entertainer/MC.” They need to make a distinction. And no I’ve never heard of Mayanna Mak as I mostly watch TVB series. I don’t watch their hosting shows, like Mr/Ms HK, etc. @coralie actually, the award is “飛躍進步女藝員”/”Most Improved Female Artiste” – artiste is not actress only. An artiste is all encompassing. It’s 藝員, not 演員. @kaykay @lewismcchan I also agree that the most deserved win of the night on the female side was Mayanne. Personally, I’m actually happy to finally see a female host who has the potential to be Dodo Cheng’s successor someday, as it is VERY MUCH needed at TVB right now. There are plenty of up-and-coming male hosts to take over for Eric Tsang but how many are there on the female side? Like two? (I’m talking hosts actually signed with TVB, not the ones they “borrow” from the various radio stations). It’s definitely not very many, that’s for sure! Hosting is not an easy job and not everyone is cut out for it – I would much rather see TVB having the likes of Mayanne (loud personality and all) hosting more variety programs than forcing us to endure those awful MHKs trying to fumble their way through a hosting gig that they obviously were not cut out for. With all that said though – in terms of MI award, even though I feel that Mayanne is deserving of the award, I can understand the “backlash” due to the expectation that an actual “actress” was expected to win. However, like I said earlier, the “backlash” should really be directed toward TVB and not Mayanne, since TVB should never have combined that award into one in the first place (it used to be separated out between drama and non-drama back in the old days). Also, by having one MI award for both drama and non-drama, TVB basically locked themselves into a corner, since it’s obvious the direction that they were trying to take with this year’s awards was to promote up-and-comers – they could’ve given the MI award on the female side to both Mayanne and Sisley and then give the Female Character award to someone else and everyone would’ve been happy (with those 2 categories at least). Btw, there IS a Best Host award but that award almost always goes to either the veteran hosts (Dodo, Eric, Nancy Sit, Liza Wang, Nat Chan, etc..) or special guest hosts (usually “big names”) that TVB most likely spent big bucks to invite (ie: Harlem Yu, Grasshopper, etc). Newer hosts rarely get a chance to win this award unless they are paired with one of the veterans or there happen to be no other worthy contenders (which is rare). The few exceptions are Sammy Leung (whom I would actually put in the veteran host category, though he isn’t technically signed to TVB so not really on the same level as the others) and also Tony Hung and Priscilla Wong, though both were already experienced hosts prior to joining TVB, plus they switched to focusing on dramas now so I guess they don’t really count in this category anymore. Vincent wins best actor before Kenneth Ma? Supporting role Natalie wins over Jessica? I don’t hate them but doesn’t seem logic to me. and what Sisley?!? ok something is definitely rigged, well won’t have high hopes it TVB awards. Ruco and Nancy left with empty hand I’ll give them credit for showing up. I wholeheartedly believe that Vincent deserted the BA award. I know some netizens are pissed that Kenneth didn’t win but I feel like he was more fit to win MFMC since his character was indeed, likable but wasn’t necessarily the best showcase of his potential talent. Kenneth has aced his comedic expressions years ago so this wasn’t a wow performance to me. The role of Ma Kwai, I felt was quite similar to his role in Three Kingdoms RPG. That said, TEM was a very entertaining series and definitely underrated. It’s also not always all about seniority and I don’t think an award should be given (or not given!) just because of the length of their career with TVB. Unfortunately, Louis Cheung is “banned” from TVB because Walking would have been a big contender for MFMC!! Best Actress was definitely a shocker. Don’t get me wrong, I do like Natalie Tong but she wasn’t a lead in My Unfair Lady. I don’t think that Jessica should have won either though (Mall Jeh was an annoying character IMO and I felt that the acting was so-so as her main co-star Frankie Lam was pretty wooden. That said, her scenes with Natalie were great). Best Actress should have gone to Elena Kong for Tiger Mom Blues or honestly, even Grace Wong for Mindhunter. I didn’t finish Destination Nowhere but saw a few clips of Kristal’s performance, which also seemed BA-worthy as well. Sisley’s win for MFFC was a unexpected and I am anticipating all the back lash that the poor girl is going to get. While I think her acceptance speech was very all-over-the-place, it definitely came through as genuine to me. I wasn’t a fan of Sisley in the beginning and found her to be pretty annoying but she truly has improved a lot in the past few years and is definitely watchable now! I was touched by her speech because it’s true – she DOES have a lot of haters. I do think she was more fit to win Most Improved but competition for that category was actually pretty tough this year. I think Ali should have won MFFC as her portrayal of Paris in MAA was great and likable! Joel’s win wasn’t surprising but I didn’t like My Unholy Alliance so I didn’t really continue watching on to be able to make any comments on this. Personally loved Ho Yuen Dong’s performance in TEM but had a feeling they wouldn’t give it to him. Rebecca Zhu’s win for BSA was the MOST SHOCKING. Home girl did not deserve it at all………..sure, she’s improved and I find her relatively watchable but damn. I have no words. It should have gone to Mandy Lam for dai siew jeh!!! If not, Moon Lau for TEM (still a shocker that she didn’t make top 5??). Matt’s win for Most Improved was deserving – he did a lot better in 2017. Looking forward to his 2018 works. Mayanne….you either love her or you hate her and I actually love her! She’s crazy, obnoxious, but very real. I wouldn’t be upset if Kaman Kong, Moon Lau or Sisley won for this category either though. I suppose I am one of the haters. After hearing her speech which came across as half dim witted and half pretentious, and I blame that on the fact that she is more not eloquent than genuinely fake, (as compared with Rebecca Zhu who was far more eloquent and far more genuine sounding and Kenneth who was also as dim witted but in a genuine way), i have worse impression of Sisley. I don’t find her genuine in her speech. She sounds like she is complaining and then complimenting her own beauty. As for her performance, it wasn’t as terrible as some would say over her previous works but it was a role any decent actress can pull it off, without the teeth. And her having that teeth is unnecessary. I don’t find her pretty enough to distract me. Some artiste should just say thank you and leave the stage instead of rambling on and on and on with empty speeches like she did. 2nd worse speech had to be Kenneth but he was thankfully not long winded. @kaykay i agree with your opinion a lot except for mat, he can win it but the others on the list out shone him to me. and not only did moon not make top 5 on supporting actress, she actually didn’t get nominated for supporting actress which is the BIGGEST disappointment to me as well as ali not getting nominated for legal mavericks. everyone else i agree with you!! I didn’t watch the show, and I’ve only seen one TVB series this year so can’t really comment except I KNOW Natalie wasn’t the female lead in My Unfair Lady so she shouldn’t have even been nominated in this category. Also, too many actors and actresses are being nominated. How about keeping it to 5 finalists, which is easier for netizens to vote too. It seems like TVB is lacking of quality actor and actress. The award is simply given to the artist for the sake of holding them on with the company. Veteran artist was always being left out. I find it furious as the bunch of veterans were not being mentioned at all during the ceremony. They too have participated in the dramas, they too had contributed and have played so well in their given character. I am a devoted tvb fans and I watch their awards ceremony every year, however, they always disappoint me.! It’s good to know that most people do think Vincent Wong is worthing of his win. I actually didn’t like his blind lawyer series thou. The one series that I thought he’s nailed it was the EU series. He’s so weird looking and the accent he tries in there is just so him. I was hoping he will win for that but hey knowing TVB he’s lucky he’s getting recognition considering some stay there years and forever and we are wondering their name. lol haha…So good for him. Like i said, didn’t care for any other wins esp the best actress. She never left an impression on me on any of her series. IDK why we’re all “shock” year in, year out on these awards. This is like their nomination list, it means nothing except the winners probably get more job opportunities and pay a little better. Don’t take any of the title to what it actually means. Best act isn’t really mean best in acting nor does most improved mean someone really improved. These winners are who TVB wants to promote or who they think “deserve.” Now and then again, they’ll throw a bone to make it look like they’re serious. i.e. Anthony, Dayo, Josie. @jjwong Very true, I remember there were a couple of supporting actors/actresses back in the days and none of them really made it after a while. TVB awards? You can’t really even take it seriously but yes if it helps them get a higher $ and more opportunities then luck is still on their side. I disagree with Rebecca Zhu’s winning as well. Very fishy. I don’t think Sisley was fake at her speech. She might not be good at public speaking. I also think she got mixed feeling. If anything her speech was different from all the other “I thank so and so blah blah…” speeches. I noticed nobody stood up or hugged her. When she was struggling at the beginning nobody gave any sign of encouragement, all silently waiting for her to continue to struggle. I feel really really bad for her. And this award will definitely just make her future more difficult. Wonder if she is still qualified for “most improved actress” later on? She has definitely improved a lot. Poor girl! I don’t like Joel Chan’s character. It’s boring. I’d love to see Gogo gets it. Oh well. I’ve always supported Natalie but agree, it’s weird that she won BA for a supporting role. Another one got scrutinized by winning an award. TVB is doing more harm to her than help. But I hope she got more meaty roles from now on and got taken care better, like Nancy did after she won. @kaykay408 Yea that was really sad that no one hugged Sisley. There was an awkward silence until someone finally said “Add oil!” I’m happy for her though, I like her character, she did well. @mindee she really did. I reall feel her when she said no one likes her and she hated herself. this years awards came as a pretty big surprise for me and it wasn’t in a good way. first of all, mat yeung only got the improved male because he had been nominated at least 5 times, it should’ve went to matthew instead as he received it in singapore and malaysia with a great performance. i think mayanne actually deserves the improved actress because she’s a great host, anyone on the list was good. rebecca winning supporting actress was totally wrong, elaine did way better. i think i’m most annoyed about joel winning supporting actor because it totally should’ve went to owen. joel’s acting is so boring and his role was easy, whereas owen has been working hard all year presenting his audiences with amazing drama performances, especially gogo in legal mavericks. i think kenneth getting favourite male is definitely accurate, i didn’t really want him to get best actor anyways but i hope he can get best actor in the coming years. sisley getting favourite female was so weird, i don’t know how she got all the votes which makes me speculate if tvb made the decision, would’ve been more right to give her most improved actress because she did really well in legal mavericks. best actor vincent!! extremely happy for him, he deserves it so much and hope he continues to do great. fantastic job on all 3 of his dramas. best actress natalie… she’s a good actress but not good enough for best actress and i don’t like how she got it for being second lead. if jessica came it would’ve went to her and if ali’s nomination was for legal mavericks and not my ages apart it would definitely be the most suitable for ali. i think ali did well in all her dramas which makes me kind of disappointed she didn’t get any awards. as for the drama award, i think it should’ve went to legal mavericks or exorcist’s meter instead. really don’t see what was so good about my ages apart besides the cast. and hubert also deserves the best theme song award. congrats to all, but i hope next year tvb gives the awards to people that actually deserve it, not to people that need the title so they become more famous. @emiliachan Agreed, though unfortunately TVB very rarely gives out awards purely because such and such artist “deserves it”. 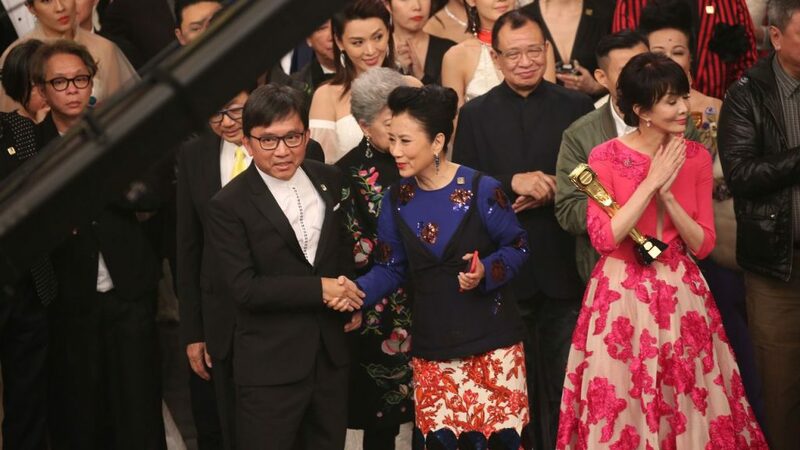 As Liza Wang alluded to in the speech she made (while accepting the 50th anniversary award on behalf of all TVB employees), nowadays at TVB, it’s all about the internal politics and power struggle between the various execs. Whoever is in power at a particular time will dictate the overall direction of the company as well as which artists get pegged for promotion and/or awards (not just acting awards but music ones as well). The last couple years, with Sandy Yu and her husband Herman Ho in power, most of their artists (the former i-Cable bunch, MHKs, Voice Entertainment artists, etc.) had taken the top slots in terms of opportunities for promotion, awards, etc. However, starting this year (technically last half of last year), the tide already started to turn with TVB’s increased reliance on the Mainland China market, which also means increased collaborations with “pro-Mainland” directors such as Wong Jing (who is probably the only big name HK director out there willing to collaborate with TVB – not surprising of course since his modus operandi and way of thinking are very much in-line with TVB’s). It’s definitely NOT a coincidence that both Rebecca Zhu and Sisley Choi were also pegged to star in Wong Jing’s upcoming projects – the announcement was actually made PRIOR to the awards but not many people paid attention because well, the focus was obviously on the awards itself and the race for TV King and Queen. Now, after the fact, when we put two and two together (everything that happened leading up to the awards plus all the “hints” that TVB execs had been dropping in various interviews), it’s no longer a surprise that the results turned out the way they did. This last awards show was an indication that Wong Jing and his Mainland faction are in power now so we can expect to see a lot more co-productions – both in terms of series (TVB) and movies (Shaw Brothers) in the coming years…. Very shocked at the awards but, once again not surprised. Vincent deserves to win this award, his role in LM was outstanding! Vincent is long overdue for this award anyway. He portrayed so many memorable character in Change of Heart, EU Over Run, Brick Slave and in My Unfair Lady that to now I still remember his versatile performance. I always liked Natalie’s performance but, she needs ‘that role’ to make a breakthrough. I love her character in MUL but, not for Best Actress. Although, there are no female leads this year that stands out. Lots of people says Jessica Hsuan deserves to win in her role in MUL which I agree to some point but, no show no award. Not surprise here. Happy that Joel won because he is great actor. Joel has worked hard these years. This award will give him more confidence and people will overlook the bad decision he made in the past and recognise him as great actor. Well done! However, Louis Cheung in ‘My Ages Apart’ for his role as ‘Walking’ should have won. But, of course of the dispute with his management company and TVB he has been ‘frozen’. So unfair because Louis is long overdue for a deserved award, not some lame ‘improved award’ he won years ago. Louis deserves for a higher and recognised award. Benz Hui is also another overlooked actor who was fantastic in LW and MAA. WTH?! I’m sorry, Rebecca’s role was not that outstanding in ‘AGSE’. Rebecca is also on the ‘Improved’ nomination list and if she won this award, I would feel alright about it but, BSA? Really when you have Grace Wong, Elaine Yiu and Susan Tse who outshone in their roles as BSA in their series. Bad choice. Yeah! Kenneth performed really well in EM. Kenneth was definitely deserve to be in the run for Best Actor this year for his performance. Unfortunately, Vincent won and Kenneth once again takes FMC award which he won years ago. Well deserved but, I hope next time you win BA Kenneth! Owen Cheung’s role in LM, definitely deserved this award too. Despite, I never liked Sisley’s past roles, she definitely portrayed as Dina pretty well.I’m not sure whether ‘Dina’ character would be my FFC. I would have preferred if Ali Lee – My Ages Apart or Jessica Hsuan – My Unfair Lady. Their characters were likeable and stood out. People may disagree on Ali but, after watching her in MAA, a vast improvement in her acting skills and her character was actually funny. All artists say, the hardest role to play is comedy and Ali did really well. I have no objections in Sisley winning FFC but, I personally would have liked Ali. ?? Matt’s acting has always been watchable but, he won this award 6 years ago! Poor guy, was embarrassed to accept it – 17 years in the industry and he still wins the same award. It’s just rude and an insult. If I was him I would melt the award and get money out of it. TVB has done this to many artists (Louis Cheung, Raymond Cho, Jonathan Cheung,Raymond Wong) in this category. Artist should get an award which they deserve, not for the sake to just get an award. It’s just an insult and inconsiderately rude to give out shonky awards like this to artists. No comment on Mayanne winning because I haven’t really watched enough variety shows with her as a commentator but, from what I have seen she talks too loud and exaggerates a bit too much. So a bit iffy about her winning this. I so wanted Moon Lau to win this award. I was so shocked she wasn’t even nominated!! Moon has shown great improvement in her acting by far. Moon so deserved to win, especially in this category. This was a fun and clever drama. People may have found it messy but, it was different, funny and enjoyable. I’m glad this drama won. If My Unfair Lady, Legal Mavericks or Exorcist Meter won in this category I would also be happy. As long, Heart of Greed 3 or Line Walker didn’t win because I think both of these dramas were overrated. The Exorcist’s Meter – Global Online Favorite Drama award.